Heavyweight destroyer Tyson Fury says that he could knock out Dereck Chisora and his sparring partner Mariusz Wach on the same night. The Manchester giant was enraged after Polish star Wach, Chisora’s chief sparring partner, said yesterday that the Finchley banger could knock out Fury early when they clash at the Phones 4 U Arena on Saturday 26th July. Chisora and Fury collide in the biggest domestic heavyweight rematch in recent years with the winner securing the WBO number one spot to world champion Wladimir Klitschko, plus the Vacant British title and Chisora’s European title are on the line. Big-hitting and hard-talking Fury has fired back at Wach and said that Team Fury heavyweight Eddie Chambers is also ready and prepared to take him on. 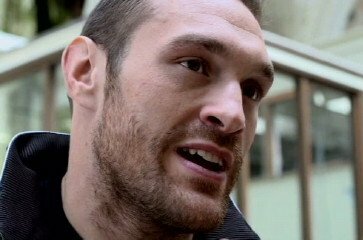 “Frankly it’s laughable that Wach seriously believes that Chisora could knock me out. I don’t know if Wach is hitting the Polish vodka a bit heavy, but to come out with a statement like that, he must be drunk!” Said Fury. Fury added that if Wach wants a proper fight while he’s over here then he should fight his stable-mate and former world title challenger, Eddie Chambers, who features on the undercard. “Eddie is there ready and waiting for him if he wants it,” said Fury.